These green twin loop wires are a great way to make your hard work stand out from the rest. While still bright, these green wires are darker than spring green. These wires come from GBC, Renz, or us, MyBinding! And we have both 3:1 and 2:1 pitch wire available. And we carry 3:1 pitch, used for document sizes 1/4" to 9/16" and 2:1 pitch, for 5/8" to 1-1/4" document sizes. We offer various lengths of wires plus the option to get a spool of twin loop wire, for custom lengths. And make sure the twin loop wires you pick out work with your machine! Lively green 2:1 pitch twin loop wire. This wire is 2:1 pitch, 2 holes per inch, 21 holes and 11" long. Hold from 20 to 310 sheets of 20# paper with wire diameters ranging from 1/4" to 1-1/2". 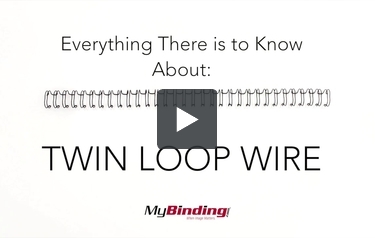 Twin loop wire can be used with a 2:1 wire binding machine or any wire closer. Premium green 3:1 twin loop wire. Premium green 2:1 twin loop wire. This wire is 11" in length and 2:1 pitch, (21 holes, 2 holes per inch). Premium green 2:1 wire with a shiny finish. Capacity to hold 20 to 310 sheets of 20lb paper, diameters from 1/4" to 1-1/2".